Sara and Jon’s love is one for the record books. These two are bright, playful, and filled with joy. They are best friends – and it is so clear that they are about to embark on a journey filled with love. I’m so excited to share their Lakeside Ranch Wedding in Inverness with you all!! The day started off foggy, but it burned off as the day continued. Sara and Jon wanted their wedding to really be about them. Neither of them felt compelled to dance the night away – so they opted for a brunch wedding (just throwing it out there – I’m a huge fan!). They shared the sweetest first look. Jon had the biggest smile on his face and gave Sara a huge hug. Guests walked to the ceremony site just before 11. Wooden stumps with candles, lanterns, colored glass, and flowers lined the aisle. A macramé curtain was the backdrop for the ceremony. The wedding party made their way down the aisle, Sara’s brother walked Buddy, their dog. Sara made her entrance on a green vintage truck. Her dad proudly accompanied her down the aisle, carrying her late mother’s Bible. Their ceremony was short and sweet. At the end of the wedding, the officiant told Jon he could kiss his bride – everyone cheered. Then, the officiant announced, “Sara, you may not kiss your groom!” and the group cheered again. It was too sweet. Brunch drinks were enjoyed during cocktail hour and the guests made their way to the barn as Bay Kings Band serenaded the group. 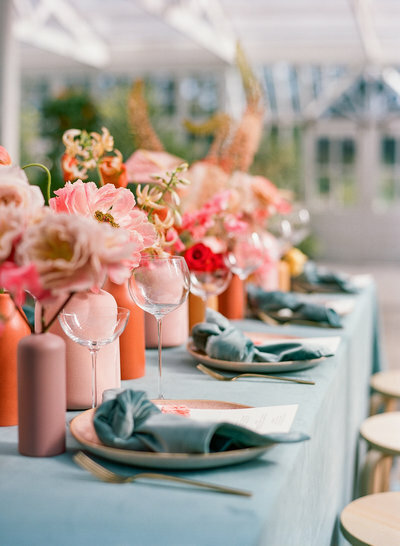 Guests found their seat (and their party animal) at farm tables covered in lanterns and colored bottles – brimming with flowers. The wedding ended with a beautiful bubble send off as we all wished the newlyweds well. Sara and Jon, I’m so grateful that we had the chance to photograph your wedding. Really, words can’t express how thankful I am. Sometimes, I just need to pinch myself! You two share so much love and I know you have decades of happiness ahead of you. Congratulations!